The Prime Minister got the headlines yesterday for his ‘launch’ of the Big Society. Along with a lot of scepticism about what the Big Society actually means. It is a concept that a lot of people are struggling to understand. And if you don’t understand something it must be wrong. Right? Plenty were there to criticise the “ConDems” (a joke surely as tired and as unfunny as New Liebore or Tony B-liar) for using the Big Society as a mask for cuts. But at its heart it seems, to me, remarkably simple. It is an admission that the state just cannot do everything. For a start it’s just isn’t feasible for the government to carry on Labour’s spending, in 2009 they managed a deficit of £159.2 billion. Even allowing for reduced revenues and extra expenditure because of the recession it is clear that spending so much more than is coming in is totally unsustainable. But there is a more fundamental issue: to what extent we should expect the state to provide for us? Yes, it should be a safety net and it should ensure that people have various minimum standards in their life. But should it intrude in every aspect of our lives? Or should it enable us to do as much as possible for ourselves and each other, and leave out the rest? The fact is that the Big Society is already all around us. 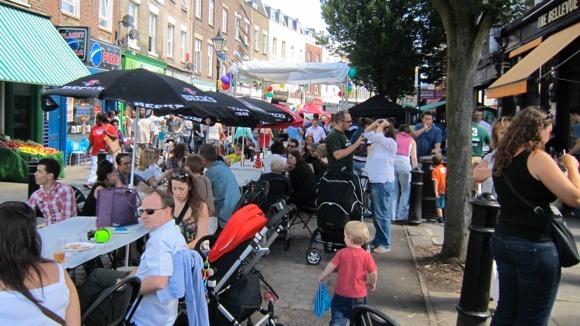 Last Sunday I went to The Big Lunch on Battersea High Street, an event put together by all the traders (everyone contributed except William Hill, who perhaps don’t feel part of the communities whose money they take). The council helped (or perhaps hindered) the organisation, but it was a prime example of a community, residents and businesses, coming together to do something special. And it was a fantastic day. But it isn’t just high-profile events like that. A lady I have known for years has, during her retirement, given her time to a number of causes: she runs her Neighbourhood Watch, been a school governor and now volunteers as a reading assistant in her local school alongside various stints of volunteering she does for charities. Near to me a chap runs a regular playgroup, charging a few pounds a session to pay for room rental, tea and biscuits he arrives in the morning and sets up with the help of the early parents and then at the end of the session clears up with the help of the late arriving parents. We all know people who give something, whether it’s running a sports team or occasionally helping out a neighbour. They are the Big Society. It isn’t pure altruism. I’m sure the businesses on Battersea High Street were pleased to have an extra 1,200 people passing through their street on a Sunday afternoon. And I’m sure that even my friend will admit that part of her motivation, as well as giving something back, is the warm fuzzy feeling that comes in return. It isn’t an issue of getting people to do the ‘state’s job’ for free, it’s about questioning whether society is better off with people building and strengthening their own communities, or just relying on the state to do everything. And helping people get more by giving more to their communities. In the words of the Conservative manifesto, there is such a thing as society, it’s just not the same thing as the state.